Notes: This anime is based on the manga by Yamada Norie and Yoshizuki Kumichi, which ran in the fantasy magazine Dragon (the same magazine that brought us Dragon Half and Scrapped Princess). With its slow pace, I first thought that Someday's Dreamers would be the next Kokoro Library: boring, dull, and dreary. Fortunately, it was the opposite. I enjoyed this anime a lot. I enjoyed the plot and most of the characters. Although Yume is a country girl, she doesn't act like a hick buffoon. She acts like somebody in real life, somebody who is awed by some of the things in the big city that she has never seen before. Oyamada Masami himself is also an interesting character. Although he has an angsty past, he is not the type who constantly whines about it, which is also refreshing. The world of this anime is one where magic is not feared and despised, but one where it is welcomed. It's similar to our ordinary world, and not everyone has magic powers. Only a small minority of people have powers, which are usually used to grant the wishes of those who ask, no matter if it be big or small. I found this world fascinating to watch. The animation is great for a TV series, extremely detailed and colorful. No toilet colors or jerky movements here, everything is excellently done. The music is also good, with the opening song being a mournful ballad, and the ending song being more upbeat, but not in a hyper way, and with a sort of "down-home" feel to it. Both songs fit this anime well. As for Geneon's dub, it was a little off, because not only did they keep the Japanese honorifics in the dub (which sounds rather "fanboyish" to me), but they also kept on jabbering about SPECIAL POWERS™, so that your average dub script for each episode would be "blahblahblah ... SPECIAL POWERS blah blah blah blah doink SPECIAL POWERS doink blah." It's kind of sad that this anime is so short at only twelve episodes. When I watched the last episode, I wanted more immediately. 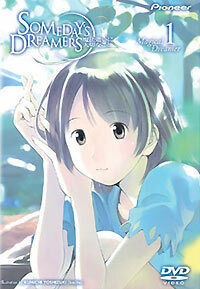 In short, I enjoyed Someday's Dreamers despite its short length, and I would recommend it. Recommended Audience: Some parents might not like the episode where Oyamada goes to a bar and is served by a skimpy-dressed waitress, but aside from that, this anime is suitable for the whole family.